Today I visited the world's first (and only) computer game museum, which opened a couple of weeks ago in Berlin. It's quite an interesting installation for the general public (though as a game developer I personally felt it could have been larger and more detailed). The last of the Goo Balls didn't know that they were on a pad, or that they were extremely tactile. 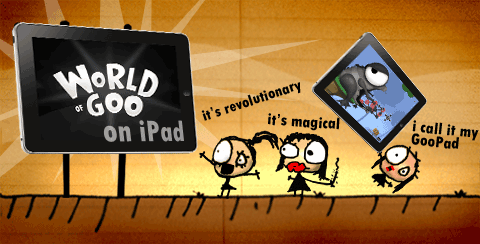 World of Goo is now available on the iPad! Get it from the App Store here for just $9.99. GooTool for iPad is also pretty much done, I'm just looking for someone with a jailbroken iPad and some technical-savvy to help test it out before I release it. Let me know if you can help! World of Goo will be released for the iPad on Thursday 16th and I'm working hard to have GooTool ready at the same time. GooTool runs on your computer and, as usual, makes a copy of the World of Goo on your iPad, avoiding modifying the original files. For this, it requires a jailbroken iPad, as it needs to copy the changed files across over Wi-Fi. I'm pleased to announce the winners of the GameGooGround beta contest. These talented Goo saviours walk away with their GameStop gift certificates as well as custom badges on both GameGround and GooFans. Edit: The contest is now concluded and the results are posted over here. Later this week, GameGround is launching their public beta to the world, but they're inviting GooFans over now for exclusive early access. In addition, they're running a special contest just for members of this site! GameGround is a lightweight personalized gaming app that enhances your games and connects players of all types. It learns not only what you're playing, but also what you're achieving on your PC, Xbox and any website. This enables new missions, rewards, high score incentives and ways to share success to prove you’re the best amongst your friends. GooTool 1.0.3 is out, and can be downloaded from the usual download page. This release features a number of major bugfixes and improvements that will make your Goo experience more pleasant. The full changelog is at the bottom of this page. No major new features are added, but all critical bugs are fixed freeing me up for work on the more drastic forthcoming 1.1.0 release. Although I released a preview of the source earlier this year, this is the first version with the corresponding source code released simultaneously. If you're interested, there is some information on how to build GooTool from source. Happy Birthday World of Goo! Happy 2nd Birthday World of Goo! Best wishes and may you live twice your age! A number of goo fans have been working on developing an expansion to World of Goo over the last few months. Formerly known as "wog2", a new name is under discussion to avoid confusion amongst players. Although most project members are already on this site, we welcome them back today as they move their official forum to GooFans.com. Daft as Brush has made a post describing our policy on what addins we'll publish on this site. Rather than paraphrase it, I'll just link directly to his post here. We are keen to maintain a high standard of addins on goofans: each one should be useful or interesting or fun on its own. Particularly note that we will no longer publish ball mods unless there's already a couple of levels using them. I just wanted to inform you (or make you remember) that Goofans.com has a IRC chatroom available here : http://goofans.com/irc.php (or click on "Web Chat" in the GooFans menu, above). I know there is a forum too but.. well, I also like to discuss with other wog-fans in real time.